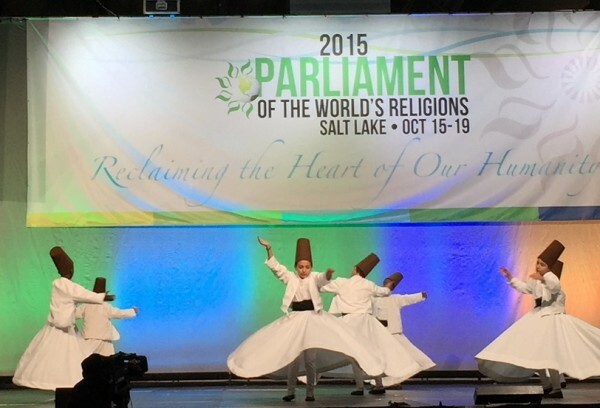 Participants in the 2015 Parliament of the World’s Religions demonstrate the whirling dance or Sufi whirling, proverbially associated with dervishes. Photo by the author. 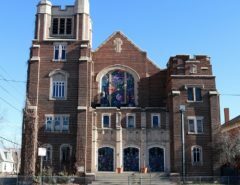 In 1893, Presbyterian minister John Henry Barrows opened the inaugural World’s Parliament of Religion in Chicago by inviting the first-ever assembly of religious leaders from across the globe to join him in a “act of common worship” and to sing Isaac Watt’s Trinitarian re-write of the 100th Psalm. This less-than-catholic invocation, which concludes with the call to “Praise Father, Son and Holy Ghost,” was followed by a similar gesture when Cardinal James Gibbons recited the Lord’s Prayer, which Barrow declared the “universal prayer” that would open each of the Parliament’s seventeen days. An event conceived as an auxiliary to the World’s Columbian Exhibition (precursor to the World’s Fair and a commemoration of the 400th anniversary of Columbus’s arrival in the New World), the 1893 Parliament was a cultural watershed in US history. While it was organized within a framework that took Christian superiority for granted, Barrows hoped it would lead to ongoing dialogue and greater tolerance, and it introduced many Americans for the first time to Buddhism, Hinduism, and even the very idea of “world religions.” The address there by Hindu ascetic Swami Vivekananda explaining Hindu ideas and bearing the message that the different religions represented in Chicago were all legitimate paths to God opened the US door to Asian worldviews and to the possibility of the syncretistic spiritualism that captivated America in the early twentieth century and remains at the heart of American religiosity. 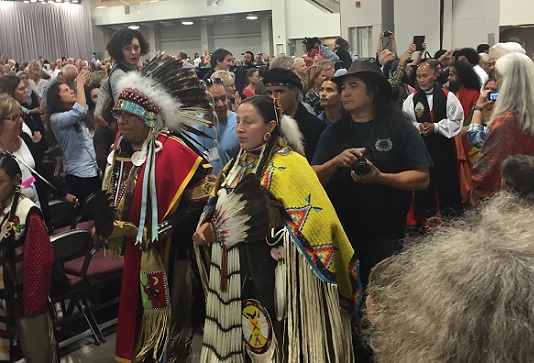 Some of the many attendees at the Parliament of the World’s Religions who represented indigenous peoples of the western United States. Photo by the author. Although the 1893 Parliament was a wild success in its day, Barrows’ vision that this unprecedented meeting would pave the way for regular dialogue among the globe’s religious peoples lay unfulfilled until 1993, when the slightly renamed Parliament of the World’s Religions celebrated the centenary of his original meeting and laid the groundwork for future such gatherings. This past week, I watched the sixth Parliament unfold as religious leaders, activists, bureaucrats, politicians, and 10,000 other attendees did their part to shape the legacy of the original event in Chicago. Barrows might have recognized the color and pageantry that marked the opening of the 2015 Parliament, but his effort to position a carefully enumerated set of world religions as partial and imperfect expressions of the highest and universal truth that only Christianity could capture has clearly been entirely subverted. Members of the Ute Indian Tribe and other peoples indigenous to the US West–excluded in 1893, along with Mormons, our other warm hosts in 2015–led the opening procession and welcomed the thousands of assembled guests to their land. Following them into the hall and cheered by a crowd delirious at the variegated display of skin color, dress, and headgear, were costumed representatives of every imaginable religious group, from Vedantists to Sufis to Pagans and lots more you’ve never even heard of. If the first Parliament operated with an implicit evolutionary framework that choreographed a hierarchical ordering of spiritual truth, the Opening Ceremony of the 2015 Parliament reveled in its own chaotic parade of difference. Once the formal ceremonies began, however, it became clear that this Parliament was organized to deliver its own carefully crafted message, and one rehearsed repeatedly throughout the week: that all religious traditions at their core share the same commitment to peaceful coexistence. This event was every bit as much peace rally as exercise in interreligious dialogue. 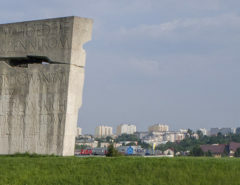 Although dogmatism, conservatism, and extremism are major forms of religious expression around the world, their proponents, if present at all, must have encountered a hostile atmosphere. Admission to this dais demanded that speakers for any one tradition lay aside claims to exclusivity and embrace the pursuit of peace and harmony that was often fervently expressed. The enforced silences, elisions, and censorships necessary to stage this display of harmony sometimes spoke loudly. Much, for example, has been made of the selection of Salt Lake City as the site of this Parliament: the final refuge of an early Mormon church driven out of the US East and Midwest until they could reach the spot that Brigham Young had seen in a vision, distant and isolated enough to allow them to practice their faith freely. In an era of distressing persecution of religious minorities on every continent, holding this event in Salt Lake City today was intended to make a clear statement about religious freedom. The odd thing is, Mormonism has distinguished itself historically for many good reasons, including its dogmatic exclusion of non-Mormons from its temples and its systematic proselytizing of others. At his welcome during the Opening Ceremony, Elder L. Whitney Clayton recalled the history of the persecution of the early Mormon community and its migration to the Great Basin: “The people who settled this land came to find peace and to practice their religion without interference,” he reminded the audience, but he also assured us that Salt Lake City was grateful for the presence of the many religious communities now resident there. 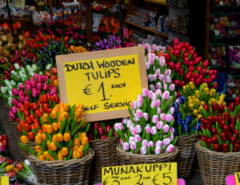 His remarks immediately called to mind for me, however, the massive and emotionally charged greeting parties for Mormon missionaries returning from their customary service that I had encountered at the airport that very afternoon. Indeed, Utah Governor Gary Herbert hinted at such a fissure when, in his welcome remarks, he reminded us that we have different doctrines but he would be praying for us. Other groups one might regard as practicing some forms of pronounced exclusion, including Hasidic Jews, Roman Catholics, Buddhist nationalists, Pentecostal Evangelicals, and fundamentalist Muslims were seriously underrepresented or entirely absent. It was less, in that respect, a Parliament of the World’s Religions and more a Parliament of Religious Liberals and Universalists. 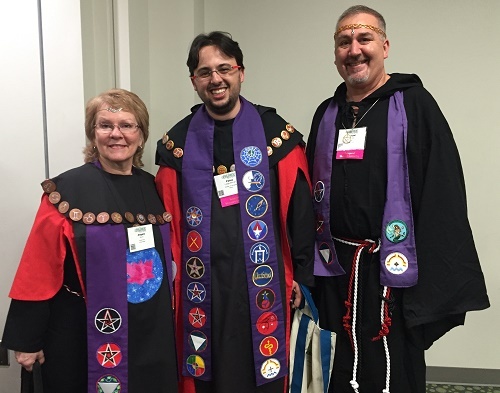 Representatives at the Parliament of the World’s Religions. Photo by the author. There was serious work afoot at the Parliament to manufacture and mobilize a consensus about battling intolerance and advancing peace, but if you came expecting lots of just plain silliness, you were not disappointed. 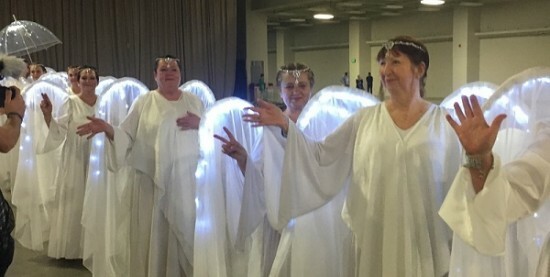 A 2015 Parliament Anthem commissioned for this gathering came off like a wickedly clever parody of shrill liberal folksongs, and had the singer segued into the Lesbian Seagull song written by Beavis and Butthead’s hippie teacher, no one would have blinked. At the Focus on Women Plenary Session, immediately at the conclusion of a sweetly sincere prayer by a Muslim interfaith leader, the Salt Lake City Drum Circle (you read that correctly) exploded on the stage and in every aisle, its members gyrating wildly, beating their drums, and stirring the crowd into a momentary frenzy. At one session I was asked to reach into the air, catch kindness and tell my neighbor what color it was. There was much more for a scoffer like me to poke fun at: ad hoc stations set up with folding chairs in the hall for channeling Johrei, a randomly appearing procession of peace angels conferring blessings with their serene gazes, demonstrations of Extra-Sensory Perception, Semitic Yoga, and much, much more, but when you looked beyond their supposed eccentricities, it was clear these people were deadly serious about peace. Twice a day, from the tightly managed plenary stage where difference could be elided and dissensions censored, that consistent message, delivered sometimes tearfully, sometimes angrily, was marshaled into a force that regularly brought the turbaned, robed, beaded, and tonsured crowd roaring to its feet. Amusing syncretisms and comical metaphysics aside, at its most emotive, this was an explicit call for revolution. What were these peace-loving types so angry about? Gender inequity, climate change, heteronormativity, global poverty, religious intolerance, consumerism, the plight of indigenous peoples, and more. The most memorable moments of raucous audience response included reactions to Marianne Williamson’s demand that “when you think about non-violent resistance, don’t just concentrate on the non-violence part, concentrate on the resistance part!,” Nobel Peace Prize Laureate Mairead Maguire’s denunciation of the US invasion of Iraq, and virtually every line of the speech by US Ambassador-at-Large for International Religious Freedom, Rabbi David Saperstein, who railed about a whole range of injustices but none so passionately as the global persecution of religious minorities. Revolution indeed, but one whose future can only be tenuous, for this new world order will arise on the unsustainable premise that at their core all religions teach the same things. It was a stock claim of virtually every single major address. I could quote endlessly from speeches that made this point, but Rabbi Amy Eilberg, the first woman ordained as Conservative rabbi by the Jewish Theological Seminary, perhaps best captured the central teaching of the Parliament, if not the theoretical justification for such a claim: “During these days we rejoice in our commonalities and explore our differences with interest and profound fascination.” Not only are all religions essentially the same, we heard, but also that insidious forces have “corrupted” or “perverted” or “distorted” the essential truths of these traditions to foment hate, violence, exclusion, and intolerance. Attendees of the 2015 Parliament of the World’s Religions in Salt Lake City, Utah. Photo by the author. No one took the time to examine the proposition that perhaps the haters and terrorists this Parliament vilified might feel precisely the same about its rendering of their faith. Off the main stage, during smaller sessions by a variety of individuals and groups, all ostensibly dedicated to peace, you could occasionally see sharp disagreement break out: about the nature and threat of Hindu Nationalism, about the Boycott, Divest and Sanctions movement, about the place of white racism among the priorities of the interfaith movement. There is surely more strife to come, but voices of dissent were largely overwhelmed by many, many acts and expressions of generosity, none on a greater scale than langar, the free lunch efficiently and cheerfully served every single day to over 7500 people by members of the international Sikh community. I came to the Parliament expecting some peacenikky sentimentality, the usual uncritical endorsements of neo-liberal tolerance, and a naïve embrace of the World Religions Paradigm that I wrote about in this piece a few weeks ago. What I found instead was a carefully organized and well-funded movement with a truly global grassroots reach rapidly gathering steam (at the closing session it was announced that the Parliament will now meet every 2 years rather than every 5-6). I have been in the religion business too long to believe that any discursive formation that looks vaguely religious could be unproblematic or wholly benign, and I fear the internal contradictions and conflict that will boil over as the movement grows. But it’s been an awful year: the savage beatings of Muslims (falsely) accused of eating beef in India, beheadings and mass executions of Christians, Yazidis, and everyone else by ISIS, a vile Islamophobia machine flush with cash in the US, and now, Jerusalem…again. If the history of religion is just an extended story of one group imposing its version of a “true faith” on another, at this particular point in history, I’m pulling for these folks. Especially if there’s free lunch. Brian K. Pennington is the Director of Elon University’s Center for the Study of Religion, Culture, and Society and Professor of Religious Studies. He is author of Was Hinduism Invented? : Britons, Indians, and The Colonial Construction of Religion, editor of Teaching Religion and Violence (2005), and co-editor with Amy L. Allocco of the forthcoming Strategic Interventions: Ritual Innovation in South Asian Religion.